2.5 Put Him Out of Our Misery! Help Barbas reunite with his master. Talk to Lod in Falkreath. Travel with Barbas to Haemar's Shame. Retrieve the Rueful Axe for Clavicus Vile. Give the Rueful Axe to Clavicus Vile or kill Barbas. 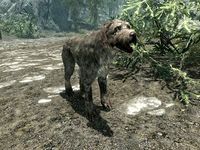 Once you reach the required level, a trip to Falkreath will net you an encounter with a guard asking a rather unusual question, namely if you have seen a stray dog running around outside town. Regardless of your answer, he will then point you to local blacksmith, Lod, who can be found working his smithy during the day. When approached Lod will only show interest in one specific dog, a 'fine, strong creature that's been wandering near town', that he would like for you to catch for him. You can either accept his request to chase down the dog or pass a very easy Speech check to persuade him to pay you part of the gold up-front for your efforts. In either case, Lod will give you some fresh meat for bait. Travel along the road a short distance southwest of town. A dog will approach and enthusiastically address you, saying "You are exactly what I was looking for". He will introduce himself as Barbas and will ask for your help. Choose the second dialogue option for a bit of background explanation. Barbas will describe a falling-out that he had with his master, and says that he needs someone who can settle the disagreement. Taunting Barbas will make him reveal his master to be Daedric Prince Clavicus Vile. You agree to arbitrate this disagreement and Barbas tells you that Vile is probably close to a cult of worshippers living near Haemar's Shame. Barbas will then be on his way towards this cavern, and you will have to follow him on a long journey. Note that traveling with Barbas can be avoided by postponing his request during the second set of dialogue responses; select "You were looking for me?" followed by "I've got things to do". This will make Barbas travel to Haemar's Shame alone. You can then fast travel to Helgen or in the proximity of Haemar's Shame. If you choose this option, see this section. Haemar's Shame is located a long way from Falkreath, at the foot of the Throat of the World, straight east from the ruined town of Helgen. Following Barbas can be difficult as Barbas tends to get lost on occasion, so keep an eye on the map marker. 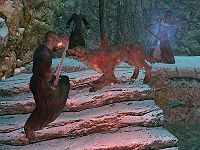 The first distraction comes when you and Barbas face an unmarked bridge guarded by bandits, just west of Falkreath. Barbas cannot be killed because he is invulnerable, so just fight the opposition and keep an eye on the dog, who may wander off. Follow Barbas past Pinewatch and up the mountain towards Helgen. The trip goes through the destroyed town, now occupied by bandits, so help Barbas fight them. When all is said and done, Barbas will open the eastern gate himself and continue towards the Throat of the World. When you finally reach Haemar's Shame, Barbas will enter right away so follow him inside. Clavicus Vile obviously suffered the same fate as many other daedric princes, and his shrine is now hidden away in a damp tomb. His worshipers consist of leveled vampires who will protect the shrine with their lives. The first room offers an enemy guarding the wooden structure and a chest. Barbas will run ahead, so you will likely be on your own. Take the eastern tunnel and beware of the spike wall trap ahead. The next chamber contains a campfire and a charred skeever guarded by two vampires. Dispose of them and investigate the wooden structure for an alchemy lab and another chest. Take the only available tunnel to a chamber in two levels, with several enemies to fight. Take a detour to the southern chamber for some loot, and examine the table on your way down for the Destruction skill book Response to Bero's Speech, then pick the northern tunnel and exit Haemar's Cavern. Clavicus Vile: "By all means, let's hear it. It's the least I could do, since you already helped me grant one final wish for my last worshipers... They were suffering so from vampirism, and begged me for a cure. Then you came and ended their misery! I couldn't have planned it better myself. So, what's your heart's desire? What kind of deal can we strike?" If you mention Barbas, he will deny the request but then equivocate. Clavicus Vile:"Ugh. That insufferable pup? Forget it. Request denied. No deal. I'm glad to be rid of him. Even if it does mean I'm stuck in this pitiful shrine, in the back end of... nowhere. Well... perhaps there is a way he could earn his place back at my side. Maybe. But no promises." You can also ask for an end to the Civil War in Skyrim to which Clavicus will reply, "Oh, if I had my full power, granting that would be trivial. I'd simply snap my fingers, and everyone in Skyrim would die. War resolved." You can also ask for power to which Clavicus will reply, "Really? Power? You're a dragonborn; you already have more power than most people who aren't immense fire-breathing monsters." or "Really? Power? Haven't you already killed enough of your foes using the more mundane means at your disposal? Swords, magic, etc.? How...uninspired. ", depending on whether or not you have completed Dragon Rising. Clavicus will conclude the last two options with: "As much as I hate to say it, you're almost as powerful as I am right now. But that's just because half of my power resides in that mutt, Barbas. Come to think of it, I know of a win-win situation for both of us." Whatever option you pick, Clavicus is only interested in one thing, the Rueful Axe, an axe powerful enough for Clavicus to have "quite a bit of fun". Clavicus will reveal that the axe is located in Rimerock Burrow and will ask you to take Barbas with you. Barbas: "One of Clavicus's little jests. A wizard named Sebastian Lort had a daughter who worshiped Hircine. When the daughter became a werewolf it drove Sebastian over the edge. He couldn't stand to see his little girl take on such a bestial form. The wizard wished for the ability to end his daughter's curse. Clavicus gave him an axe." Barbas throws himself at Sebastian Lort. Rimerock Burrow is located on the hillside in the northwest corner of the map and can be tricky to find, especially if you approach it from the wrong angle. Take the road leading south from Lost Echo Cave and follow it as it twists and turns. At the crossroads, take the snowy path leading northwest and you will get straight to the entrance. Inside, you will encounter a hostile leveled atronach, presumably created by Sebastian Lort as an extra guardian. Sebastian himself can be found in the next room, equally hostile and will not hesitate to use his conjuration spells. After the battle, claim the Rueful Axe from the table and examine the room for a bit of loot, an arcane enchanter and the Conjuration skill book 2920, Hearth Fire, v9 on Sebastian's nightstand in the following room. It is now time to return to Clavicus Vile in Haemar's Shame. Put Him Out of Our Misery! Back at Haemar's Shame, the map marker will point towards the cavern entrance, which will force you to travel through the entire cave system once again. To circumvent this, head west up the road until the path bends. A pine is growing on the left, against the mountain wall; the back entrance is behind this tree below the top of the tree. Reaching the back entrance is fairly easy. If you reach the first piled up set of rocks on the left, you've gone too far. Note that this only works if you previously opened the spike gate by pulling the chain behind Clavicus Vile's statue. Otherwise, the gate will be closed and you will not be able to access the room. Inside the cavern, Barbas will once again sit in front of his master. When approached, Clavicus Vile has one final prank to play and will give you a choice: you can keep the Rueful Axe if you use it to kill Barbas. The dog will understandably jump up and try to tell you that it is not the only option available. Speak to Barbas and Clavicus Vile for further elaboration and make a decision. Kill Barbas and keep the Rueful Axe, or hand the axe to Clavicus Vile and receive his true daedric artifact, namely the Masque of Clavicus Vile. Note that both items are unique, but only the Masque of Clavicus Vile counts towards the Oblivion Walker achievement, so it is recommended to keep Barbas alive. Regardless of your choice, Barbas and Clavicus Vile will be reunited and you will receive your reward. Finally, return to Lod in Falkreath for a small amount of gold and his gratitude. You may choose not to complete this quest in order to instead keep Barbas as an invincible follower. Alternatively, you can complete the quest without ever traveling with Barbas. To do this, don't follow him to Haemar's Shame but let him get there on his own. After accepting the task from Vile, tell Barbas to stop following you. You can receive the gold reward from Lod after speaking with Barbas for the first time, rather than waiting until the quest is finished. Prior to the quest, a leveled conjurer will inhabit Rimerock Burrow. When the quest is started, that conjurer will be renamed Sebastian Lort. With the appropriate dialogue choices, Clavicus Vile will begrudgingly admit that without Barbas, he would be no more powerful than the Dragonborn. 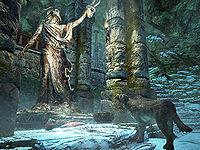 If you have not been back to Helgen since the beginning of the game, the eastern gate may be locked and Barbas will be unable to open it. You can pick the lock and open it yourself, but this may push Barbas back into the wall where he'll be trapped. It is enough to unlock the gate, as once unlocked Barbas will be able to open it himself, thus avoiding the aforementioned bug. If you have yet to clear Helgen of the bandits, Barbas may start wandering Helgen aimlessly after helping you kill them. Fast traveling anywhere, even to Helgen, will fix this. 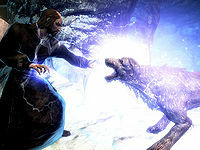 If Barbas encounters the skeleton of a dragon blocking his path on the way to Haemar's Shame, such as the remains of a dragon killed recently in Falkreath, he may stop to sniff at the skeleton like any other dog in the game and be unable to proceed. ? The dragon skeleton can be moved out of Barbas's path using the Unrelenting Force shout. Traveling to Haemar's Shame (or using one of the other methods mentioned above) will also reunite the Dragonborn with Barbas. On PC, the player can open the console (~), click on Barbas, close the console, move the Dragonborn a ways past the obstructing skeleton, open the console again, and use the console command moveto player to move Barbas to the far side of the skeleton, where he will proceed on his path (or simply use Barbas's reference ID with the "moveto player" command instead of clicking on him). 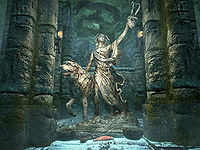 If you decide not to kill Barbas, and talk to him before he gets turned into stone, the whole statue of Clavicus Vile will disappear and Barbas will remain in the room forever. He will no longer follow you or respond to you in any way but remains stuck in your party restricting your ability to recruit any dog companions thereafter. You may be able to fix this if you have yet to discover Meeko at his cabin. Telling Barbas to wait inside Rimerock Barrow may cause him to disappear at the moment you take the axe. If you choose to kill Barbas, it is possible to follow the map marker and find him drifting around in the wilderness. Use the axe to kill him and the quest will proceed as normal. ? If Lod is dead, guards may still direct you to speak with him. If you tell Barbas to stop following you and then fast travel, he may disappear and not be where he was supposed to be when you return. This will occur even if you simply tell him to stay while at a landmark then immediately open the map and fast travel to that landmark. The best way to avoid this is to simply make sure Barbas is following you before you fast travel anywhere. Barbas may not appear where he's supposed to. In this case open the console and type prid 52535 followed by moveto player when you are at either Rimerock Burrow or back at Haemar's Shame. If you retrieve the axe and hit Barbas he will die and the quest will still be active. ? If you don't travel to Haemar's Shame with Barbas, then when you get there, he and all of the Vampires in the cell will be behind the fence leading outside, fighting. If the fighting causes them to go past the trigger point where the game moves you outside, you'll have to use projectiles to kill the Vampires. ? 5 A guard outside Falkreath mentioned the Blacksmith Lod is looking for a Dog and offering a reward. 25 I ran in to a talking dog named Barbas who said he wanted my help. He's waiting outside Haemar's Shame. 50 I ran in to a talking dog named Barbas who said he had a falling out with his master and wanted my help. He's waiting outside Haemar's Shame. 70 I ran in to a talking dog named Barbas who had a falling out with his master Clavicus Vile. Clavicus has agreed to take Barbas back if Barbas and I retrieve the Rueful Axe. 150 I ran in to a talking dog named Barbas who had a falling out with his master Clavicus Vile. I've retrieved the Rueful axe for Clavicus. I can keep the axe if I kill Barbas or I can return the axe, reunite Barbas and Clavicus Vile and receive the Masque of Clavicus Vile. 155 I ran in to a talking dog named Barbas who had a falling out with his master Clavicus Vile. I've retrieved the Rueful Axe for Clavicus who offered me a deal. I decided to kill Barbas and keep the Rueful Axe. 200 Finishes quest I ran in to a talking dog named Barbas who had a falling out with his master Clavicus Vile. I've retrieved the Rueful Axe for Clavicus who offered me a deal. I decided to reunite Barbas and Vile and received the Masque of Clavicus Vile. DA03: 0, 5, 7, 10, 15, 27, 60, 75, 77, 90, 105, 107, 151, 152. On the PC, it is possible to use the console to advance through the quest by entering setstage DA03 stage, where stage is the number of the stage you wish to complete. It is not possible to un-complete (i.e. go back) quest stages, but it is possible to clear all stages of the quest using resetquest DA03. This page was last modified on 2 April 2019, at 14:25.